Introduction Primary blast lung injury causes intrapulmonary haemorrhage. A number of case reports have suggested the efficacy of recombinant activated factor VII (rFVIIa) in the treatment of diffuse alveolar haemorrhage from a range of medical causes, but its efficacy in blast lung is unknown. The aim of this study was to investigate whether nebulised rFVIIa attenuates the haemorrhagic effects of blast lung injury in an animal model. Methods Terminally anaesthetised rabbits subjected to blast lung injury were randomised to receive either rFVIIa or placebo via a nebuliser. The primary outcome was the level of blood iron–transferrin complex, a marker of the extent of blast lung injury, analysed using low temperature electron paramagnetic resonance spectroscopy. Results Blast exposure led to a significant fall in iron-bound transferrin in both groups of animals (p<0.001), which remained depressed during the study. There were no significant differences in iron–transferrin between the rFVIIa and placebo treatment groups over the duration of the study (p=0.081), and there was no trend towards elevated iron–transferrin in the rFVIIa-treated group once drug treatment had started. There was suggestive evidence of systemic absorption of rFVIIa given via the inhaled route. Conclusion A single dose of nebulised rFVIIa did not attenuate pulmonary haemorrhage in a rabbit model of blast lung injury. As there was some evidence of systemic absorption, the inhaled route does not avoid the concern about potential thromboembolic complications from administration of rFVIIa. This material is licensed under the terms of the Open Government Licence except where otherwise stated. To view this licence, visit http://www.nationalarchives.gov.uk/doc/open-government-licence/version/3 or write to the Information Policy Team, The National Archives, Kew, London TW9 4DU, or email: psi@nationalarchives.gsi.gov.uk. A number of reports have suggested the efficacy of recombinant activated factor VII (rFVIIa) in the treatment of diffuse alveolar haemorrhage from a range of medical causes, but its efficacy in blast lung is unknown. This study was conducted to investigate whether nebulised rFVIIa attenuates the haemorrhagic effects of blast lung injury. A single dose of nebulised recombinant activated factor VII did not attenuate pulmonary haemorrhage in a rabbit model of blast lung injury. Blast injuries are an increasing problem in both military and civilian practice. Primary blast lung injury is caused by the shock wave, which precipitates rupture of alveolar capillaries and subsequent intrapulmonary haemorrhage and oedema. For casualties surviving the initial blast, depending on the distance from the blast and the protection worn, the most common cause of injury in an open environment following an explosion is secondary injury from fragmentation. Combat body armour protects individuals from torso fragmentation wounds but affords little protection against the blast wave and primary injury such as blast lung. If the explosion is in an enclosed environment, such as inside a building, the shock wave is reflected and amplified by the surfaces causing greater risk of primary blast injury. The current management of blast lung is predominantly supportive, with mechanical ventilation being the mainstay in severe cases. A significant number of patients with blast lung could easily overwhelm a medical treatment facility with limited critical care resources such as a deployed field hospital. Treatment that is targeted at reducing intrapulmonary haemorrhage may reduce the severity of blast lung. Initial anecdotal reports from Israel suggested that intravenous rFVIIa could reduce the severity of blast lung injury and associated clinical problems (personal communication Martinowitz-Kirkman, 2008). This was followed by a series of case reports where rFVIIa was given to patients with diffuse alveolar haemorrhage of diverse aetiology. The most comprehensive was a report by Heslet et al,7 who reported success when rFVIIa was administered by the endobronchial route. This is attractive as a possible use in blast lung as an effective and safe early treatment that attenuates intrapulmonary haemorrhage that would have a significant impact on the resources necessary to deal with blast lung, in particular where there are multiple casualties. It may also have benefit optimising patient condition prior to and during aeromedical transfer back to the UK from theatres of operations. Intravenous administration of rFVIIa carries the potential risk of thromboembolic complications, and hence caution continues to be employed when prescribing for off-label indications. If rFVIIa could be delivered by inhalation, it may be limited to local distribution and not absorbed systemically, reducing the potential for adverse events. To date, there have been no controlled human studies to determine the effects of rFVIIa, delivered either intravenously or by inhalation, on blast lung. The aim of this study was to use an animal model to investigate the effects of nebulised rFVIIa on blast lung injury and in particular to determine whether inhaled rFVIIa can attenuate the haemorrhagic consequences of blast lung. A rabbit model of blast lung injury was used for this study, as the rabbit has excellent cross-species interaction with human rFVIIa (and human tissue factor interacts well with rabbit FVII).8 The study was conducted on Female New Zealand white rabbits, average weight 2.5 kg (range 2.30–2.78 kg), which were fed ad libitum with a commercial rabbit diet and allowed free access to water. The rabbits were given an intramuscular injection of midazolam (as a premedication) at a dose of 1–2 mg/kg. They were left in a warmed environment (with overhead heater) for 15–30 min until they appeared comfortable and mildly sedated. They were then transferred to an operating table, where the lateral ear vein was cannulated with a 24G cannula. Induction of anaesthesia was by intravenous injection of alfaxalone, at 2–3 mg/kg, following a period of preoxygenation via a face mask. An uncuffed endotracheal tube was then inserted into the trachea. Anaesthesia was maintained using isoflurane, delivered through an anaesthetic circuit along with nitrous oxide and supplemental oxygen. Once surgical anaesthesia was established, and the animal was monitored using a Propaq monitor with end tidal CO2 and pulse oximetry, the neck was surgically dissected, and cannulae was placed into the common carotid artery and the jugular vein. These were secured by sutures, and the wound closed. This allowed central venous access, blood sampling and continuous invasive blood pressure monitoring. The animal was then transferred onto a SCIREQ flexiVENT ventilator. Initial ventilatory parameters used were a tidal volume of 7–8 mL/kg, pressure limited to 30 cm water, a positive end-expiratory pressure of 5 cm, and the rate was adjusted to maintain an arterial partial pressure of carbon dioxide (PaCO2) of approximately 5.2 KPa. The ventilator had an Aeroneb laboratory nebuliser (SCIREQ) connected to the inspiratory limb of the ventilation circuit, and this was used to deliver nebulised material to the animal during experiments requiring this procedure. Once central venous access was established, a surgical plane of anaesthesia was maintained using alfaxalone at 1–2 mL/kg/hour (10 mg/mL solution), and midazolam 0.08–0.24 mg/kg/hour (5 mg/mL solution) was given intravenously, and the isoflurane was discontinued. Animals were provided with maintenance intravenous fluids (6 mL/kg/hour of 0.9% saline) during the experimental phase. Blast lung was assessed by quantifying systemic blood iron–transferrin complex, analysed using low temperature electron paramagnetic resonance (EPR) spectroscopy. This is an established method of quantifying the degree of blast lung and making serial measurements of blast lung.9–12 In addition, cardiovascular and arterial blood gas measurements were made throughout the study. HR and blood pressure were recorded using PowerLab and LabChart software. Arterial blood samples were taken anaerobically into heparinised syringes and arterial blood gas measurements made with GEM3500 (Werfen UK). Preliminary studies13 showed that rFVIIa retained 99% of its bioactivity following nebulisation. Approximately 10%–15% of the nebulised rFVIIa was retained within lung tissue and was deposited at all levels of the respiratory tree from the main airways to the alveoli (Figure 1). Diaminobenzidine (DAB) staining indicating rFVII distribution in lung sections from terminal bronchioles and alveoli. rFVII, recombinant activated factor VII. Once animals had been prepared as above, they were subjected to a blast wave, delivered using a shock tube (Figure 2). The driving section (left side of the diagram) is enclosed when a diaphragm made of acetate sheets is inserted and the pressurised locking device employed to close the system. Once the driving section is pressurised to the desired level, the firing pin is deployed (by remote firing switch) to puncture the acetate sheets, creating a shock wave. The test section (right side of the diagram) then carries the shock wave to the end, where the animal is subjected to the effects of the shock wave. Animals were randomised to receive either rFVIIa (200 µg/kg total dose deposited in the lungs, n=7) or the equivalent volume of normal saline (placebo, n=6) via nebulisation. The animal was returned to the ventilator, and the solution (either rFVIIa or placebo) was nebulised into the animal 30 min after blast exposure, following which it was kept anaesthetised and ventilated for 24 hours. Blood samples were taken anaerobically into heparinised syringes before blast exposure and at 1, 3, 6, 12 and 24 hours after blast for arterial blood gas analysis. Further samples of arterial blood (2.5 mL) were taken at baseline and 3, 6, 12 and 24 hours into lithium heparin (16iu heparin/mL final concentration, TekLab, UK) after blast exposure for EPR spectroscopy.14 Finally, blood samples were taken into sodium citrate (9:1, blood:citrate, TekLab, UK) for bioassay of factor VII activity (HemosIL, ACL Elite, Instrumentation Laboratory, USA) at baseline and 2 hours after rFVIIa administration. At 24 hours postblast injury, the animals were humanely killed by intravenous injection of pentabarbitone, following which postmortem examination was undertaken. Data distribution was assessed using the Shapiro-Wilk test, and any non-normal distribution was normalised with an appropriate transformation prior to subsequent analysis. EPR data required a log-transformation to normalise the distribution for statistical analysis. The data for this variable were subsequently detransformed and presented as geometric means with their 95% CIs. There was no evidence that the other variables were not normally distributed and hence they are presented as arithmetic means and SEM. Single point comparisons between groups were made with a t-test, while data recorded over time were assessed using a repeated measures analysis of variance. A value of p<0.05 was considered statistically significant. 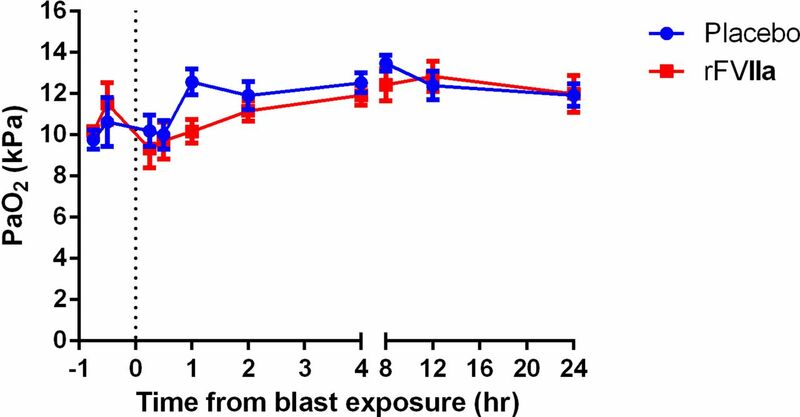 Blast exposure had little cardiovascular effect at the timepoints measured in this study. Over the course of the study, there were no significant differences in mean arterial blood pressure between treatment groups (p=0.564) or over time (p=0.254, Figure 3). HR was significantly lower overall in the rFVIIa treated group (p=0.034, Figure 4), but although the difference was statistically significant, the levels were within the normal physiological range for rabbits in both groups and unlikely to be of any physiological significance. There were no significant differences in HR over time (p=0.470). Mean blood pressure (MBP) plotted against time. rFVIIa, recombinant activated factor VII. HR plotted against time. rFVIIa, recombinant activated factor VII. Blast exposure did not result in a sharp fall in arterial oxygenation in either drug treatment group (Figure 5). Overall, there were statistically significant changes in PaO2 over time (p=0.045), although these were in the normal physiological range for the anaesthetised rabbit and of no physiological significance. There were no significant differences in PaO2 between treatment groups over the first 4 hours after blast exposure (p=0.261), or in the pattern of PaO2 changes between groups (p=0.108). PaO2 plotted against time. PaO2, arterial oxygen tension (or pressure); rFVIIa, recombinant activated factor VII. PaCO2 did not show a sharp change after blast exposure, although there was a steady decline over the course of the study (p<0.001), which was not different between treatment groups (p=0.646, Figure 6). This mirrored the pattern seen in arterial base excess (ABE) over the same time period (Figure 7, p<0.001), without difference between groups (p=0.947) or differences in pattern over time between groups (p=0.100). Finally arterial pH showed neither differences over time (p=0.388) nor between groups (p=0.687) over the first 4 hours after blast exposure. PaCO2 plotted against time. PaCO2, arterial partial pressure of carbon dioxide ; rFVIIa, recombinant activated factor VII. ABE plotted against time. ABE, arterial base excess; rFVIIa, recombinant activated factor VII. 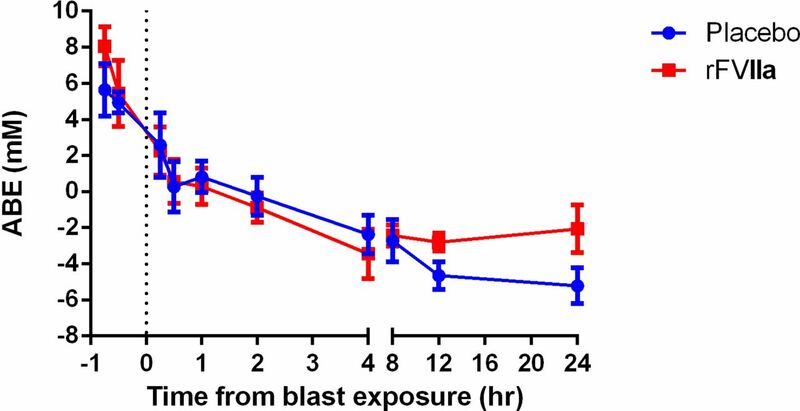 There was no significant difference between groups in plasma Fe-TRF prior to blast exposure (Figure 8, p=0.2930, t-test). Blast exposure led to a significant fall in Fe-TRF in both groups of animals (p<0.001), which remained depressed for the remaining 24 hours of the study. There were no significant differences in Fe-TRF between the rFVIIa and placebo treatment groups over the duration of the study (p=0.081), and no significant difference between groups in the pattern of Fe-TRF levels over the period of the study (p=0.787). Finally, Figure 8 reveals that there was no trend towards elevated Fe-TRF in the rFVIIa-treated group during this study, once drug treatment had started. Serum iron–transferrin plotted against time. Fe-TRF, iron–transferrin; rFVIIa, recombinant activated factor VII. There were no significant differences between groups in baseline (preblast) plasma FVIIa activity (p=0.949). 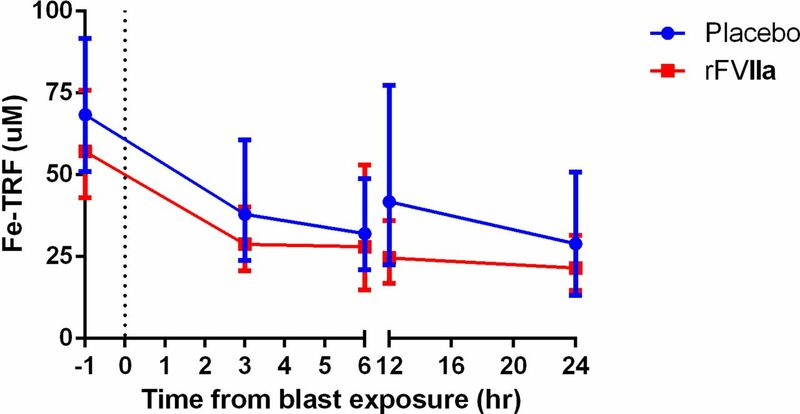 Two hours after administration of inhaled rFVIIa (2.5 hours after blast exposure), plasma FVIIa activity was elevated in the rFVIIa group, although this did not attain statistical significance (p=0.055) (Figure 9). Concurrently, there was a small fall compared with baseline in the group given placebo (p=0.400). Difference in plasma rFVIIa activity between baseline and 2 hours post drug treatment in placebo and rFVIIa groups. rFVIIa, recombinant activated factor VII. This study has shown no evidence that the administration of a single dose of rFVIIa via the inhaled route (nebulisation) 30 min after blast exposure attenuates the haemorrhagic element of blast lung injury. 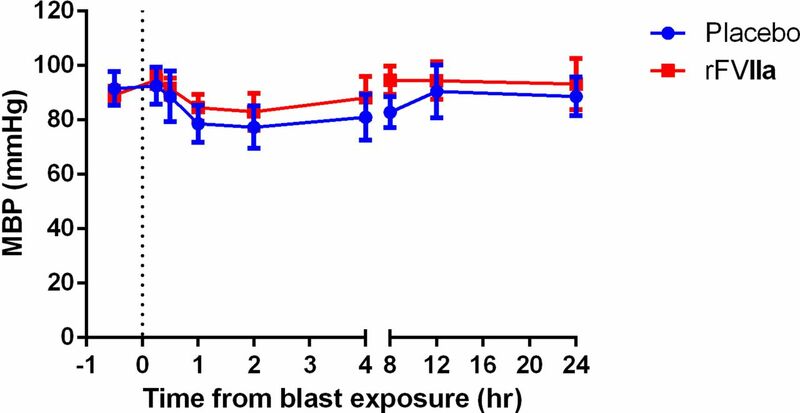 It is superficially surprising that blast exposure did not result in a significant change in arterial oxygenation or provoke a cardiovascular response in this study. 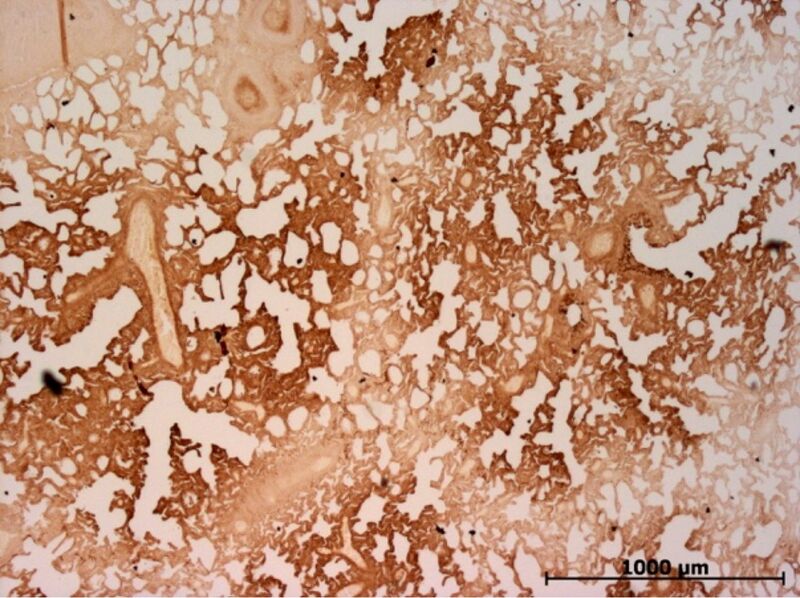 However, other groups have also reported a lack of hypoxaemia after blast exposure in rabbits,15 despite clear histological evidence of blast lung, which is contrary to findings in rats16 and pigs.1 The lack of an acute change in arterial partial pressure of carbon dioxide was not surprising given the absence of a hypoxic response. The gradual fall in PaCO2 over the course of the study is of physiological significance since it probably represents a respiratory compensation to a developing metabolic acidosis (significant fall in ABE), resulting in maintenance of arterial pH near baseline levels. However, since there were no significant differences between treatment groups in this respect, this represents a feature of the model rather than a treatment effect. Finally, regarding the absence of an observed cardiovascular response, the acute cardiovascular response to blast exposure can be short lived after moderate blast injury. In the present study the first timepoint, where it was possible to make a detailed measurement of HR and blood pressure was 15 min after blast exposure, which could have missed an early cardiovascular response. In the present study, there was clear postmortem evidence of lung contusion. Blast lung injury is characterised by rupture of alveolar capillaries and subsequent intrapulmonary haemorrhage and oedema, similar to pulmonary contusion from blunt chest trauma.17 18 Intrapulmonary haemorrhage, with free blood and haemoglobin in the alveoli, leads to the formation of free radicals, oedema and an augmented early inflammatory response, with accumulation of inflammatory mediators and chemotaxis, as well as free radical reactions causing oxidative damage.12 19 A reliable quantification of this would require either lung sectioning and reconstruction, or the utilisation of three-dimensional imaging techniques such as CT or MRI, but neither of these were available. We therefore used an alternative method of quantifying the consequences and severity of blast lung by measuring the Fe-TRF complex in blood using EPR spectroscopy. Measuring changes in Fe-TRF is an established method of quantifying blast lung and allows serial measurements to track the development of blast lung.12 In the present study, blast resulted in an expected, sustained reduction in Fe-TRF, which represents the development of blast lung in a study where the only trauma is blast exposure of the chest. However, there were no significant differences between the groups given rFVIIa and placebo, suggesting the rFVIIa as a single dose given 30 min after blast exposure did not attenuate the development of blast lung. Furthermore, there was evidence of a systemic absorption of rFVIIa since there was an elevation of rFVIIa levels in the rFVIIa-treated group but not in the group given placebo. Caution must be used in interpreting this finding as the difference did not attain statistical significance (p=0.055). However, given the clinical concern regarding prothrombotic risk associated with systemic rFVIIa,6 it is important to acknowledge the trend suggestive of systemic absorption seen in this study. Blast lung injury has been shown to affect up to 11% of patients injured by explosion on military operations.20 This poses a significant burden on deployed health resources and often affects patients most during the difficult period of repatriation to their home country, as the effects of blast lung injury on gas exchange often peak at 24–48 hours following exposure.21–23 rFVIIa has been used in several case reports and series of patients with intrapulmonary haemorrhage from other medical causes.24–26 Its intravenous use for patients with blast lung injury was endorsed by the Advisory Group on Military Medicine in 2010. However, its use has declined in deployed medical treatment facilities, as the institution of haemostatic resuscitation protocols and bespoke blood product replacement guided by bedside thromboelastometry have become integrated into standard practice.27 rFVIIa may have a role, however, in patients who have specific haemorrhage that is not controllable by surgical means, such as intrapulmonary haemorrhage. The main limitation of this study was that the initial parameter that we hoped to use as a primary outcome was oxygenation, which would have provided a parameter that has immediate clinical significance. This could have been achieved by conducting the study on anaesthetised rats. However, unfortunately human rFVIIa is relatively ineffective in rats. The implications of this study are that rFVIIa delivers no benefit when given by the inhaled route to animals that have sustained blast lung injury. Further work may use the model to investigate other drugs that may ameliorate the haemorrhagic phase of blast lung injury. rFVIIa, delivered by the inhaled route, did not attenuate pulmonary haemorrhage in a rabbit model of blast lung injury. We would like to acknowledge the contribution of Professor Lars Heslet, who came to us with the suggestion that inhaled rFVIIa might have a role in the treatment of blast lung, following his clinical success with intrabronchial rFVIIa in patients with diffuse alveolar haemorrhage of medical origin. Professor Heslet was engaged throughout the project from discussion of protocol to results and interpretation. It was a pleasure working with Professor Heslet during this project. We are also grateful to Mr Chris Taylor (Dstl) for histological and immunohistological assessment, Dr Dimitri Svistunenko (Essex University) for performing the EPR analysis and Mr Bob Gwyther (Dstl) for statistical analysis of the data in this paper. Finally, we are indebted to a large team of Dstl trial staff, without whom the study could not have been completed.
. Tissue factor and factor VIIa cross-species compatibility. Front Biosci 2012;17:3196–215.
. Inhaled recombinant activated factor VII (rFVIIa) in the management of blast lung injury. Newcastle: Newcaste University, 2012.
. Recombinant factor VIIa in massive haemoptysis associated with chronic necrotising aspergillosis. Coll Antropol 2008;32:999–1002. Contributors The study was conceived by SW, EK and JES. All authors were involved in carrying out aspects of the study. Data analysis and interpretation were undertaken by EK, SW and JES. The initial draft was written by JES, and subsequent revisions were made by EK and SW. All authors have contributed to and approved the final manuscript for publication. Disclaimer The contents include material subject to © Crown copyright (YYY), Dstl. This material is licensed under the terms of the Open Government Licence except where otherwise stated. To view this licence, visit or write to the Information Policy Team, The National Archives, Kew, London TW9 4DU, or email: psi@nationalarchives.gsi.gov.uk. Ethics approval The study was ethically reviewed and conducted in accordance with the Animals (Scientific Procedures) Act, 1986.